Unlike studio yoga, Outta Hatha, which literally means Outdoor Yoga, provides endless opportunities for everyone to “go with the flow”. Doyenne: How did Outta Hatha begin? Shu Ting: We didn’t set it up with the intention to make money or be entrepreneurial. It was more of experimenting, throwing ideas in and seeing how it goes. Before Outta Hatha, we were Spice Yoga, founded by Ling, who did the teacher training programme with us. She moved to New York, asked if we wanted to take over and we took it on. At that time, I had left my job to pursue yoga full time. Johanna, despite holding a corporate role and raising two young children, was keen to teach more yoga. So we sat down, rebranded it, and called it Outta Hatha. 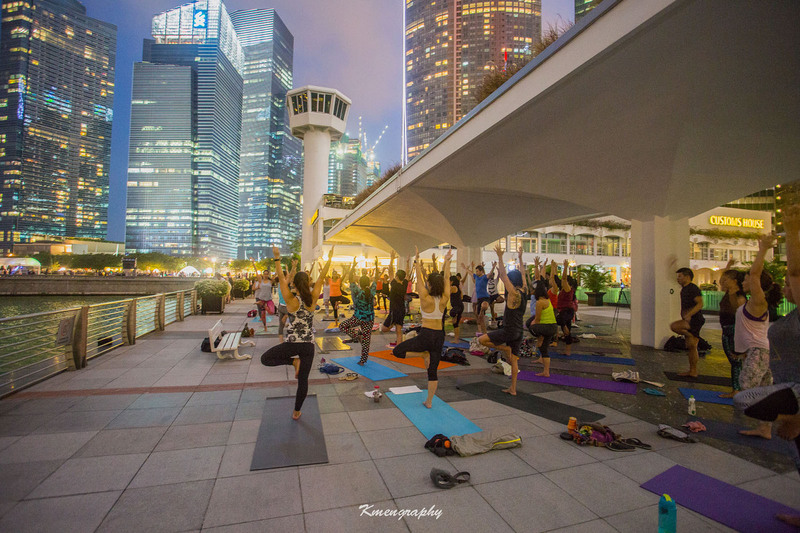 Since 2015, we have been working with Fullerton Heritage to bring life to their waterfront spaces at Customs House Terrace with our classes. D: Is practicing yoga in the CBD different from the studio? Unlike a studio environment where there is a room full of students and you don’t know anybody, we know the students we teach. There’s humility and approachability in this system of trust. Johanna: Sometimes, it can be artificial in studios. It is too easy for students to focus as you can’t talk and there are no external distractions. ST: So we create a sanctuary in the CBD. Life is always full of distractions, you need to focus despite them. At times, it could be a little crazy with music blasting and tourists taking photos. But when you are in the zone, you manage to shut it all out. It is also liberating in a sense that, students don’t have to face the mirror and compare. They work on their own practice. For teachers, we let them do what they like – chant, talk about philosophy. We break down the boundaries of the studio, where they need to give a certain type of class to get people to sweat. It’s not really yoga when they are limited by things they can’t do. D: What is yoga to both of you? ST & J: Yoga is a lifestyle that brings a lot of joy, health and peace. It facilitates making the right choices when we are more calm and relaxed. D: What is your most satisfying experience as a yoga instructor? J: Whether as a student or a teacher, yoga is about spreading the same joy. Someone from my class came up to me and asked if I could teach her sister, who is now a private student of mine recovering from serious illness and trauma. It felt great yet a little intimidating that they trusted me. Since then, we’ve been doing classes. It is even better to hear that it’s going well and she feels like yoga is working out for her. When a student gives such positive feedback, it is really illuminating! D: Share your favourite yoga poses with us! J: It’s ever-changing, but inversions are great because I am learning them now. It gives me so much joy to see the progress. Inversions are really the essence of yoga – they are wonderful because you can’t think while doing them. Everything slows down when I stay in balance. Once you get the balance, there’s nothing in your mind. But you realise you are balancing, then you fall because you start to think about it! It’s very meditating for me even though it is momentary. It’s a beautiful state of not thinking since we are thinking all the time. D: What’s next for Outta Hatha? ST: We will just see where it takes us! We have grown organically through word of mouth. People enjoy the class because of the teachers, then they bring their friends. It has also been a fun experiment thus far. First, we had outdoor classes. Then we had pop-ups on Saturdays with guest teachers. This year, we held workshops with foreign teachers. These days, we’ve been talking about a retreat, and maybe merchandise! Unlike studio yoga, Outta Hatha, which literally means Outdoor Yoga, provides endless opportunities for everyone to “go with the flow”. 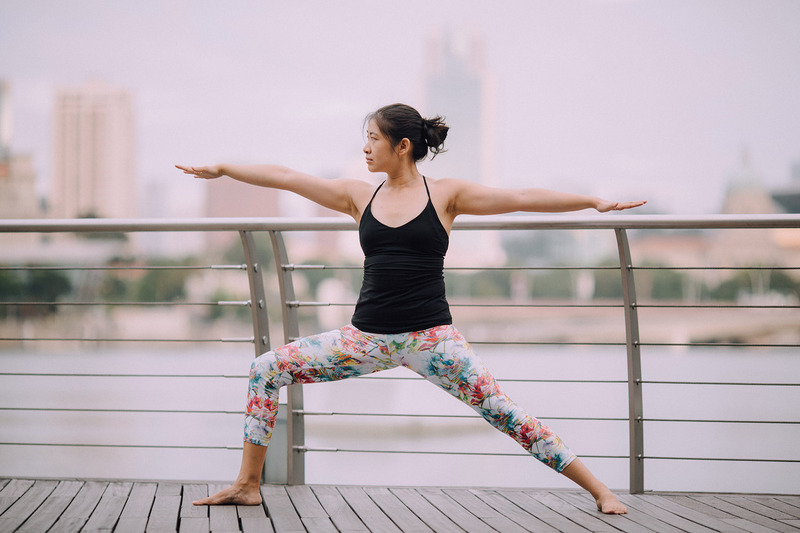 Shu Ting and Johanna guide everyone to take inspiration and energy from the great outdoors to recharge, rejuvenate and restore balance in their minds and bodies. Join them for a unique experience and awesome view in the CBD! Awesome looking website. I recently built mine and I was looking for some ideas for my site and you gave me a few. Can I ask you whether you delpeoevd the website by youself?